Though not nearly the least well-received of Academy Award winner Guillermo del Toro’s directorial efforts, CRIMSON PEAK (2015) typically warrants little more than a shrug from fans. Between bona fide masterpieces like THE DEVIL’S BACKBONE (2001), PAN’S LABYRINTH (2006), and THE SHAPE OF WATER and mainstream misfires such as MIMIC (1997) and BLADE II (2002), del Toro’s Victorian fright show falls squarely in the middle of the pack, having received middling to good reviews upon release. While a 73% Rotten Tomatoes score is nothing to sniff at, CRIMSON PEAK is far and away from Del Toro’s most accomplished or coherent piece of filmmaking—a slight and perhaps over-stylized haunted house melodrama that calls to mind the expression “all dressed up with nowhere to go.” This isn’t to say that there aren’t pleasures to be found in CRIMSON PEAK, and four years on, the film goes down much more smoothly without the anticipation surrounding it. If you avoided it back then, or haven’t seen it since, now is the perfect time to revisit its ruddy summits in Arrow Video’s lavish new deluxe Blu-ray set. The film stars Mia Wasikowska as Edith Cushing, a haunted American heiress who finds herself swept up in the violent intrigues of the Sharpe siblings: a brother and sister pair who come to New York hunting investors to help fund a new excavator to harvest the super-strong red clay of their homeland. Inventor Sir Thomas Sharpe (Tom Hiddleston) is soon taken with Edith, marrying and bearing her away to his ancestral home of Allerdale Hall despite the protestations of her friend, Dr. Alan McMichael (Charlie Hunnam) and father, Carter Cushing (Jim Beaver) who is found dead under mysterious circumstances just prior to their elopement. Upon arrival at the Sharpe’s dilapidated manor, Edith finds herself disturbed by her new husband’s lack of affection and the cool contempt with which she’s treated by his sister, Lucille (Jessica Chastain). To make matters worse, Edith is visited by ghosts who remind her of her deceased mother’s spectral warnings to “beware Crimson Peak”, the moniker by which she learns Allerdale is known in the surrounding countryside. Taking inspiration from Poe, Hammer Films, Robert Wise, Jack Clayton, and even Kubrick’s THE SHINING (which he once described as an “Everest of the haunted house movie”) del Toro’s film is a retelling of the French folktale “Bluebeard” shot through with his own thematic fixations (man as monster, privilege vs hard work) and trimmed in the lurid reds and greens he so often favors. Designed within an inch of its proverbial life, CRIMSON PEAK is a textbook example of style over substance—the director’s typically relatable characters left pinned and gasping beneath an avalanche of brocade, period theatrics, and computer-generated moths. Much like Federico Luppi, Ivana Baquero, or, most recently, Sally Hawkins, Wasikowska plays one of Del Toro’s signature outsider characters, but her role as the film’s odd duck is ill-defined. She’s given the unwomanly 19th century vocation of author, which earns her derision from her social sphere (“Our very own Jane Austen” one character sneers, to which Edith responds that she’d prefer to be a Mary Shelley as “she died a widow”…though with her ghost obsession she’s more of an Emily Brontë, but I digress), but otherwise she’s just a high society girl with a unique pastime. She’s also irritatingly slow on the uptake, a plot crutch that makes the might-as-well-be fluorescent red flags raised by the Sharpe siblings’ behavior even more campily villainous than might have been intended. Hiddleston gives a barely-there performance (and Hunnam is barely there in a more literal sense as a totally inconsequential would be love interest), but Chastain is just right, playing the conniving and deadly Lucille like an evil fairytale queen. The stiff, mannered dialogue by del Toro and Matthew Robbins creaks with lines like “The past, Thomas. You’re always looking to the past. You won’t find me there!” and the extended climax—which is filled with all manner of dark revelations and a frenzied pursuit through Allerdale—is exciting enough, though ultimately fails to satisfy. But at the end of the day, the breathtaking design is CRIMSON PEAK’s selling point, and, as is apparent from the cornucopia of featurettes on the disc, not a single corner was cut and every stylistic choice was intentional and immaculately crafted. 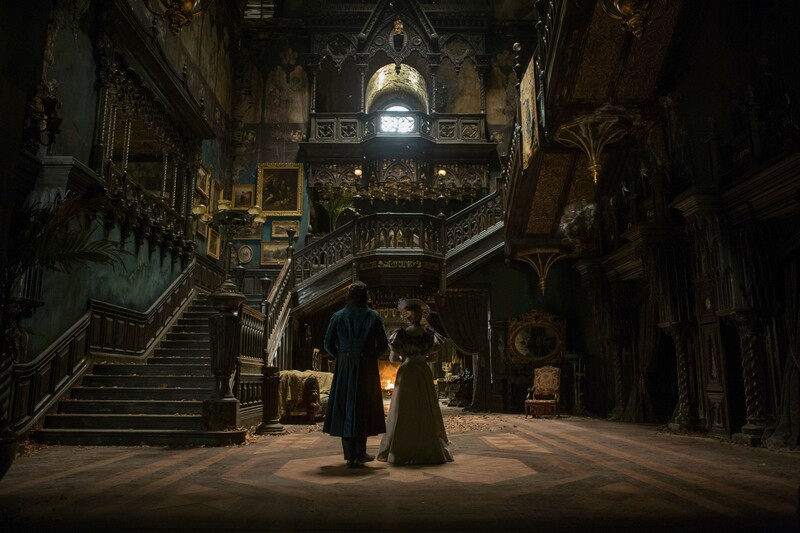 On a solid HD television, CRIMSON PEAK comes alive in a way it didn’t theatrically. What once felt chilly and over-designed takes on a more tactile and grounded (though no less ethereal) visual richness: present in every stitch of umber velvet and cream-colored silk. The glowy, burnt yellow splendor of the early scenes is pristine, but the shadowy blues, reds and greens of Allerdale Hall swallow some of the finer details in the second half, and there are moments of noise present. Arrow presents the film in an AVC encoded 1080p transfer in 1.85:1, which seems to be the exact same transfer as the original 2015 release disc. This will be a bummer to anyone who grabbed it back then, but those who haven’t seen the film since its theatrical run will be pleasantly surprised. For those on the fence, this special edition contains a mountain of older special features covering every aspect of CRIMSON PEAK’s conception, as well as a few new gems from Arrow, including a newly filmed interview with author and critic Kim Newman on the film and the gothic romance tradition, a video essay by Kat Ellinger, Editor-in-Chief of Diabolique Magazine, and THE HOUSE IS ALIVE: CONSTRUCTING CRIMSON PEAK, a newly edited, feature-length documentary with cast and crew interviews and extensive behind the scenes footage. The disc comes with a double-sided poster, six lobby card reproductions, and an 80-page, hard-bound book featuring new writing by David Jenkins and Simon Abrams, an archival interview with Guillermo del Toro, and original conceptual design illustrations by artists Guy Davis and Oscar Chichoni. All these goodies are housed in a gorgeous, tome-like case designed by Guy Davis, who served as concept artist on the film. 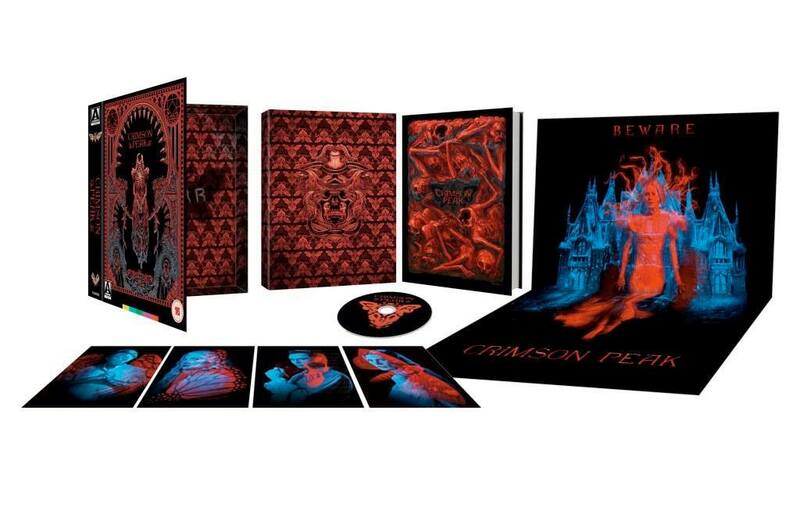 Drunk on macabre opulence and mad romance, Guillermo del Toro’s CRIMSON PEAK is surely the director’s biggest accomplishment in pure style: a point that Arrow Video makes again and again in its sensational new Special Edition set. 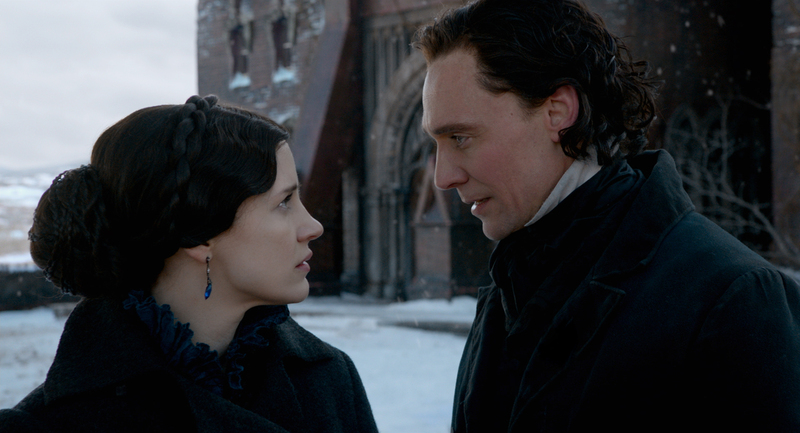 In lieu of a new transfer, the label offers up features and essays focused more on the film’s embrace Gothic tropes and its impeccable design than its content or narrative peccadillos, making it easier to appreciate CRIMSON PEAK as a formalist exercise by a modern master of operatic horror. Though the spell it casts remains as bloodless and fleeting as the phantoms that drift its halls, CRIMSON PEAK deserves a second look now that the passage of time has cleared the red sludge from its lungs and allowed it to breathe.